That's a lot of packing space. 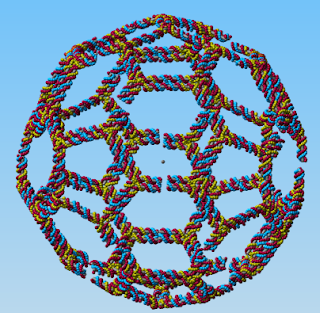 I've got a pdb file for a nifty cell membrane "valve" I wonder how well it would fit into the faces of the DNA buckyball. Hmmm.... Then you'd have a conditionally openable container. It also occurs to me that it'd be a stone cold breeze to cover the hexagons and pentagons with DNA origami tiles thus forming an empty solid. The edges of the tiles could be ph sensitive to release their connection to the polygon struts except along one edge and that'd be a simple flap valve.